PRAIZHOUSE: C.I.A DROPS " WHAT YOU DO"
C.I.A DROPS " WHAT YOU DO"
CIA (Christ I Abide) is a movement of 7 hiphop artists (DIKKY, PROPANE, NOLLY, KINSU, CEDAR, DABZ, DEXTA) who are out to affect lives positively through hiphop. Before they came together as a crew late last year (2011), they have been dropping singles individually and also doing hiphop cyphers with other hiphop artists of like minds on campus (University of Nigeria, Nsukka) which has gained audience online, and has also been featured on a few sites and blogs. After a successful release of their debut single, "TOUCH DOWN" in March 2012, they are back again with another slamming jam. 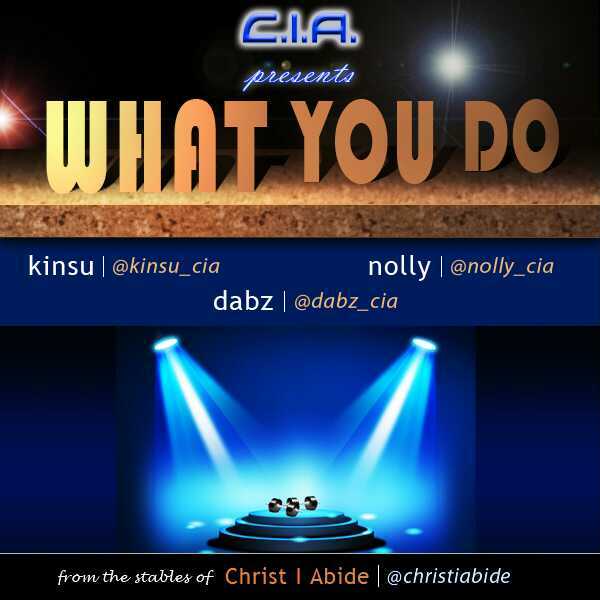 This time, it's a party jam with a crazy naija beat produced by KINSU, and it's titled WHAT YOU DO. It features three of the seven CIA members; KINSU, DABZ and NOLLY. This song will definitely get you on your feet and dancing!